A University of Exeter professor has presented a £5,500 cheque to the chair of the Camborne School of Mines (CSM) Trust to fund a new female scholarship in mining engineering. 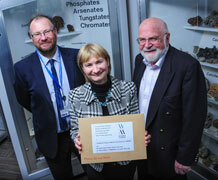 Frances Wall, Professor of Applied Mineralogy at CSM handed over the gift to CSM Trust chair Tony Batchelor, at the trust’s AGM on Penryn Campus last Friday, on behalf of Women in Mining (UK), an organisation dedicated to promoting the career development of women in mining and minerals. The money, raised by WIM(UK) through the raffle of a Faberge amethyst ring last December which was donated to the organisation by Gemfields plc, was presented as part of a wider initiative to encourage more women into the field of mining engineering. It will pay for the creation of a scholarship for a female student on the MSc in Mining Engineering, the only course of its kind in the UK. Professor Wall, who is on the membership committee of WIM (UK), as well as being closely involved with the search for a woman scholarship student is hoping the initiative will enhance the number of women students on the course which currently stand at two out of a cohort of 16. “This is an exciting and generous donation from WIM(UK). We are now about to start a recruitment campaign for the student that will make this money count,” she said. The scholarship will be advertised for the MSc course, a conversion course for physical science graduates, which starts in September. Professor Wall was the first woman Head of CSM and the first woman president of the Mineralogical Society of Great Britain. Guyana’s Urica Primus has been an agent of change since an early age. The 25-year old president of the Guyana Women Miners Organisation (GWMO) is an unabashed workaholic who campaigns hard for diversity and to break the stereotype that women can only hold menial positions in the mining sector.